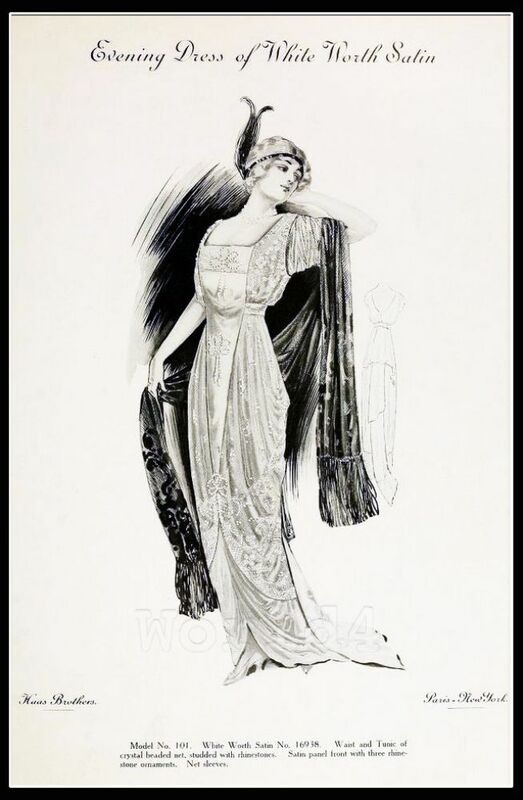 Evening dress of White Worth Satin. Paris Spring Season 1913. Home » Evening dress of White Worth Satin. Paris Spring Season 1913. White Worth Satin. Waist and Tunic of crystal beaded net, studded with rhinestones. Satin panel front with three rhine-stone ornaments. Net sleeves. Créateur couturier Charles Frederick Worth. Published by Haas brothers, for the spring season, 1913. 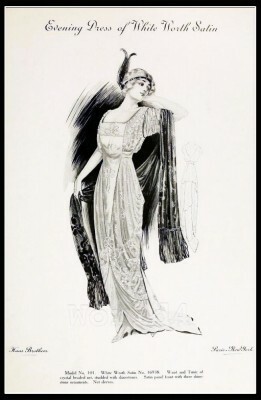 This entry was posted in 10s, 1913, 20th Century, Fin de siècle, France, Haute couture, Headdresses and tagged Belle Epoque Fashion, Charles Frederick Worth, Couturier on 8/8/13 by world4.